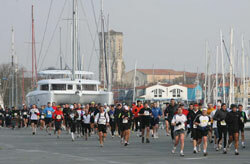 Nearly 15,000 runners took part in the 10th edition. Although the cool (12°C) and cloudy conditions were good and despite a strong elite field the course records remained intact. Nine runners went through halfway 1:05:46 as Solomon Molla already started to push the pace. Only after 35km did the race begin in earnest, again with a surge from Molla. Nicholas Chelimo kept close but not quite close enough, as Molla improved his marathon best by over two minutes and ran the second half three minutes faster than the first. Chelimo was also drawn to a personal best. Course record holder Jason Mbote dropped out at around 30km. The women's race was an exclusively Korean affair. Sung-Young Lee made her move from the beginning and soon dropped everyone else. Two exciting, closely-fought races yielded new course records by large margins, under exceptionally favourable weather conditions. The men's winner, Deribe Merga, equalled Haile Gebrselassie's world leading time for 2008 and perhaps made up for some of the disappointment he must have felt on just missing an Olympic bronze medal in Beijing, when he was overtaken with only 250m to go. In Delhi the same fate looked possible for the final 2km or more, as Merga launched a sustained drive for the finish but remained only a few metres ahead of Wilson Kipsang. Kipsang fought hard, but could not quite close the gap and crossed the line a second after Merga. In the women's race Asefelech Mergia had an equally slim winning margin over Genet Getanah. Peninah Arusei, who managed only fifth in the World Half Marathon Championships, significantly raised her game to run a close third in 1:08:20, improving her season's best by two seconds. Both races started off at breakneck speed as Merga and Arusei pushed the pace. 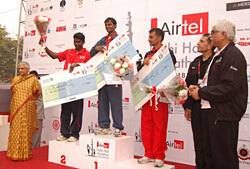 The first kilometre was covered in 2:39 and 2:57 respectively, and the times at 3km were 8:01 and 9:07. Conditions were exceptionally favourable for running with the sun struggling to break through the morning mist. A slight rise over a flyover in the 4th kilometre did little to kill the speed, as the 5km splits were 13:36 and 15:22. At 7.5km the course reaches Delhi's emblematic landmark of India Gate, and then turns down Rajpath towards the New Delhi Government buildings, offering one of the world's most famous vistas. While Arusei continued to lead, Merga was being kept close company by countryman Regassa Tilahun and the Kenyan pair, Wilsons Chebet and Kipsang. At 10km, approaching the turnaround point, the men passed through in 27:27 (sub-58-minute pace) and Arusei in 31:23 (1:06:15, so also world record pace) with Aselech Mergia and Genet Getanah a few metres behind. On the long run for home the pace not surprisingly relented, although Tilahun dropped back before 15km (passed in 41:45, just outside world record pace at 58:43). Although the lead changed several times it was again Merga who drove for home over the last three kilometres. He won a slight advantage which eventually proved enough to keep him ahead of the charging Kipsang, who improved his personal best from 61 minutes to 59:16. Asefelech Mergia took the women's race in the same way she had taken silver in the World Half Marathon Championships three weeks previously - with a ferocious sprint finish. Genet Getanah was only a second behind, and the hardworking Arusei a further two seconds back, improving her previous season's best by the same margin. Behind the top three in both races some quality times were registered, with Dieudonne Disi finishing only four seconds slower than his winning time of last year, but in sixth position. Similarly, the first eight women broke Deribe Alemu's old course record of 1:10:30. On one of the toughest courses in the world a Kenyan from the Masai Mara broke the race record by two minutes writes Pat Butcher. Paul Lekuraa shrugged off fatigue, a splitting headache, a late arrival, and the close attentions of colleague Julius Kiprotich. In a thrilling finish in the Panathenaiko, the marble stadium built for the 1896 Olympics, 35-year old Lekuraa, in only his second marathon, just outsprinted his rival. "I wasn't feeling well, and had a bad headache for most of the race," said Lekuraa. "I thought of dropping out, but I waited. In the end I relaxed, and thought I could win with a sprint." His discomfort wasn't evident, but given the history of this classic race runners just have to get on with it. Lekuraa did just that, loping easily along in the lee of the pacemaker, Megidio Bourifa, until he dropped out at 24km. There were still a half dozen men in the lead group, but by 35km, after cresting the long climb up from the coastal plain only the eventual three top finishers were left. Lekuraa's participation in Athens was secured with a phone call from former world record holder Paul Tergat, who called agent, Zane Branson in Europe two weeks before. Branson got Lekuraa into the race 10 days ago, but the Greek consulate in Nairobi only dated the visa from the day before the race. "It was worth the trouble" said Lekuraa, with the gap-toothed smile characteristic of the Masai. The women's race was won by favourite, Mai Tagami, whose parents travelled from Japan just the day before. Tagami, 28, ran with Russian Elena Tikhonova until halfway in just over 79 minutes, but like Lekuraa, she ran the second half faster. She is now targeting the Osaka Marathon in mid-January, one of the Japanese selection races for the IAAF World Championships in Berlin next summer. "The pace was slow on the hills," said Tagami, "but it got harder when I was by myself. I'd like to beat my personal best (2:29:43) in Osaka." The Greek titles were won by Georgios Karavidas, in 2:22:18, and again by Georgia Ampatzidou in 2:40:53. Overhauling the pre-race favourite Yoko Shibui at 38.4km, on the steepest part of the course, Yoshimi Ozaki won the 30th and final edition of this historic race - the first ever annual marathon held exclusively for women writes Ken Nakamura. Her winning time was the third fastest recorded (behind 2:21:37 by Mizuki Noguchi in 2007 and 2:22:12 by Eri Yamaguchi in 1999). 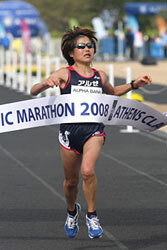 It was Ozaki's second marathon and her first win. Ozaki's surprise at winning contrasted with second-placed Kano's expectations: "I was only thinking about winning. I held back, but when the time to overtake Shibui came, Ozaki was there," she said. The top three finishers all recorded personal bests. Briton Mara Yamauchi, in third said: "I thought I could run 2:23, so I went out at that pace. I expected the lead group to come back to me but I could not pick up at the end." The front-running Shibui finished a disappointing fourth: "my problem is the last 5km" she said. Being first Japanese, Ozaki gained automatic selection for the 2009 World Championships team in Berlin. Shibui may run the Nagoya Women's marathon in an attempt to make the team for Berlin. Shibui shot through 400m in 81 seconds and 1km in 3:18. Along with Ozaki, Kano and Magdaline Chemjor she soon broke away, leaving Yamauchi and Salina Kosgei in the chasing pack. Shibui led through 5km in 16:22, 17 seconds ahead. Kano and Ozaki fell behind. while Shibui and Chemjor passed 10km in 32:55. Ozaki and Kano were 12 seconds behind, with Yamauchi and Kosgei another 28 seconds back. Chemjor started to drop back at 12km and was passed by Kano and Ozaki at 14km. Chemjor eventually finished 14th with 2:46:18. As Kano moved ahead of Ozaki, Shibui passed halfway in 1:10:07, 36 seconds ahead of Kano and a minute up on Ozaki. Yamauchi was a further 20 seconds behind. At 25km Yamauchi moved passed Ozaki into third spot but Ozaki stuck in. "I was in a bad patch" she said later. Shibui was meanwhile slowing, and took over 17 minutes from 25-30km, and 17:44 from 30-35km. Ozaki rallied: she made up 39 seconds on Kano from 30-38km and went on to take the lead from the faltering Shibui. At 39km Kano caught Shibui, and Marauchi passed her at 41km. Ozaki extended her lead to win by 56 seconds. Chala Dechasa, who finished 2nd in last month's 2008 ING Amsterdam Marathon, stormed to an impressive victory in the men's race. In the women's race defending champion Wude Ayalew repeated her victory to become only the second athlete to record two consecutive wins in the race's eight-year history. Chala's victory was a further triumph for his coach Getaneh Tessema who has coached each of the past three winners of the men's race. 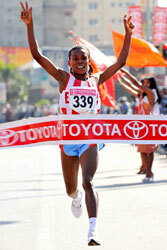 Deriba Merga who won this race in 2006 gave the toughest challenge to Dechasa, leading the race until the 6km point, at which point Dechasa took the lead up the hill past the National palace, eventually dropping Merga in the race's 9th kilometre. In the women's race Ayalew broke clear just after the 5km point, coming home in a slightly faster time than her winning time of last year. Britain's Mohammed Farah finished 15th in 29:48, one place behind Ayele Abshiro who last Sunday had beaten Kenenisa Bekele over 15km in Holland. Duncan Kibet broke the course record, finishing in 2:07:53 on the impressive Piazza Castello in the centre of the city. Despite the almost freezing weather conditions with temperatures of 3°C at the start the first three all clocked personal bests on the fast Milan course. In contrast to Kibet's, Anna Incerti's win was quite a surprise. The 28 year-old Italian took the race with a great personal best, beating the big favourite Pamela Chepchumba. The race confirmed its position as Italy's fastest men's race. 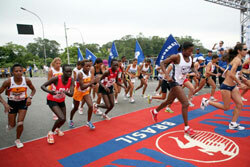 A record number of 5,875 runners from 61 countries registered for the marathon. 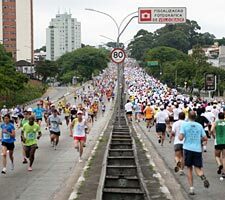 Good weather drew 12,000 runners to Sao Paulo's Legislative Assembly for the start of the 14th edition of the race. "Sport brings people closer together and helps to educate people, so the City has to be part of these events", said Sao Paulo's mayor, Gilberto Kassab, who attended the race. The women's elite set off at 07:50, 10 minutes before the mass race, including the 4km walk, which allowed a large number of beginners and new runners to experience a mass event. Fast and flat from the start, the course ran through tree-lined streets near the main city park, the Parque do Ibirapuera, allowing athletes to hit a fast pace. After 2km, Nicholas Kiprutto Koech, Daniel Kipchirchir Too and Franck Caldeira took the lead, although Caldeira abandoned after 4km. "I am coming from a period training at high altitude, and I could not keep up the pace, but I believe that I soon will be able to." Kenyans dominated the women's race: Nancy Jepkosegi Kipron did not give her opponents the slightest chance and won the race for the second consecutive year. "This year it was easier than last year. I like this race very much, it is my kind of race", she said. Several Olympic medallists participated, such as swimmer César Cielo, gymnast Daiane dos Santos, swimmer and Paralympic athlete Clodoaldo dos Santos and former volleyball player Mauricio. The 8th edition of the race enjoyed excellent weather conditions, allowing an exuberant determinated pace from Patrick Ntiwa that resulted in a stunning new course record. 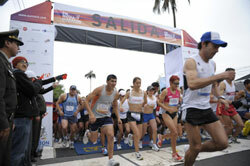 Nearly 2000 runners started from the Touristic Fundidora Park (until 1986 a steel factory, but now used for business and sport events and as recreational space). 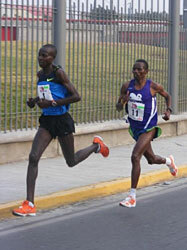 Through the centre of Monterrey City the competition was very tight between Ntiwa and Hillary Kimayo who strongly pushed each other on and built up a great lead. The favourable conditions (13°C, but also 534m above sea level) and flat course helped them to set new records. Ntiwa surged at 15km and Kimaiyo remained behind, but a kilometre later he reacted, pushing the pace alongside Ntiwa. 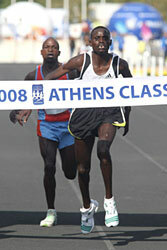 Only at the very end as they approached the finish line did Ntiwa manage to get ahead, to cut 65 seconds off the Mexican all-comers record set by Simon Biwot (1:01:27) in 1999. Genoveva Jelagat, a Kenyan living in the Toluca mountains, won the women's race after a great competition with her US-based compatriots Ivonne Ngetich and Evaline Jelagat. Of 101 entered 90 started the first 11.1km stage, split 75% men and 25% women. A new "Pairs" event attracted 9 teams, where one man and one women living at the same address qualify as a team. Strong winds and rain had abated by the time the runners started at 13:00. 2007 winner Brian Magri set off with intent, alongside the 2005 winner Jonathon Balzan. The two forged ahead of the rest of the field until at 5.5km on the Dingli Cliffs, Magri pulled out with calf problems. Balzan took the stage win almost two minutes clear of Johann Galea. Evergreen Carol Walsh, the 1992, 2006 and 2007 winner, finished ahead of the 2002, 2003, 2004 and 2005 Carmen Hili in seventh place overall. The four Maltese runners who have run all the "Challenges" - Charles Darmanin, Paul Fenech, Carmel Herd and George Spiteri - all finished. Next day the show moved to the South of the Island, the small fishing village of Birzebbuga, for the shortest stage of 6km. This pretty village enjoyed far better weather than the day before with sunshine and little wind. The finishing order of the first three repeated itself from the previous day, and all runners finished. The final 25km stage started with a beautiful sunrise at 07.00, adjacent to the historic setting of the "Knights of St. John" Tower of Wign acourt in St. Paul's Bay. Continuing good weather meant that the water and Powerade stations were well used. In 2005, Jonathan Balzan, first ever home winner of the Challenge in 2005, became the first double winner in 2008. It was the third time in four years that a Maltese man had won this unique International event. Maltese dominated in both categories after Carol Walsh, sixth overall, retained the women's title. "My time of 2:26:29 is better than when I won in 2005 so I'm very proud of that" said Balzan. "3 years older, but 73 seconds faster". Third-placed Simon Lia was the race revelation, improving his stage three time from 1:48:52 last year to 1:37:50, and his overall time by 15.5 minutes. Carol Walsh took an unassailable three-minute lead into the final stage and duly won her third successive Challenge title, while second-placed Carmen Hili said she was overjoyed at beating the three-hour barrier. Alemayehu Shumye obliterated the course record by over four minutes to win by over three minutes writes Pat Butcher. The first three were inside the previous record of 2:17:04 set by Paul Rugut of Kenya in the inaugural race in 2003. The women's race was swept by the Ethiopians. 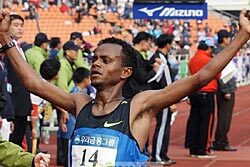 Rarely does an Ethiopian or Kenyan predict victory, but 20-year old Alemayehu did just that — and criticised the pacemaker. "After 28km, I had to go by myself," he said immediately after the race. "The pace was too slow, but it was also very windy, and a little hot. If not, I could have run 2:11 today". Around 12°C at the 07:00 race start, the sun in clear blue Mediterranean skies made the finish temperature of 18°C seem much hotter. Alemayehu comes from Nazret, 100km east of Addis Ababa, but only took up running four years ago after moving to the Ethiopian capital. "I started because of Haile, I want to be like him," he says. Three marathon wins out of three this year, with a best of 2:11:50 is a good start. Alemayehu's record time was also a successful step up for the marathon organisers, who have succeeded on mobilising a population traumatised by 30 years of conflict into getting out onto the scarred streets for something positive. 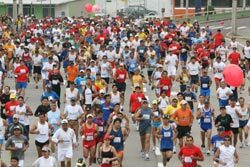 Inside five years, they have built their ancillary fun-runs, 5km and 10km races, into events which attract almost 30,000 people. The Mayor of La Rochelle, Mr Maxime Bono set off a record field of 7229 starters in two waves for this 18th edition. The men's lead group went through 10km in 30:23 and halfway in 1:04:23 - significantly faster than the planned 2:10:30 pace, and probably much faster than was wise. By that time five runners were still together. At 35km it was down to two Ethiopians and a Kenyan: Ketema Amenissa, Feyisa Tusse and David Toniok. Toniok led from 25km, but at 39km Amenissa pushed on ahead for the first ever Ethiopian victory in La Rochelle. The women's race included two double winners, Beatrice Omwanza and Elizabeth Chemweno. They went through 10km in 36:52 along with Florence Jepkosgei and Catherine Kurui, but by halfway Chemweno was on her own, passing through in 1:16:46. She went on to record an untroubled win. Anzhelika Averkova benefitted from a steady early pace to come through into second place, three minutes behind. By contrast, Beatrice Omwanza fell off her initial pace, but still managed third. Giovanna Volpato returned to form after her Achilles tendon injury from the Osaka World Championships in 2007, with a solo win. Kenyans swept the podium in the men's race and Italy's Migidio Bourifa taking fourth. Nearly 8000 started from the Piazzale Michelangelo despite a rainstorm during the night and the threatening clouds in the morning which soon broke. Heavy rain fell for half the race but 7,350 runners finished, 1000 more than the previous year. The lead group passed through 10km in 31:14. In the women's race the Italians Marcella Mancini and Giovanna Volpato imposed the pace together with young Ethiopian Elfeneshe Melaku and the surprising British runner Alice Braham. All passed 10km in 36:28 At halfway Bourifa led the men in 1:05:37 followed by a group led by Kenyans John Birgen and Paul Ngeny Kipkemboi. The leading women passed by in 1:16:30. The decisive point in the men's race came at 35km when Jackson Kirwa Kiprono took the lead alongside the more experienced John Birgen. 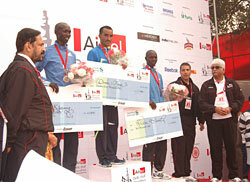 Bourifa and Kipkemboi progressively lost ground. 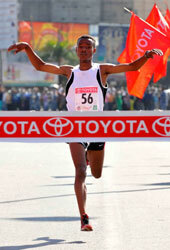 The finish was a breathless sprint between Birgen and Kiprono, with Kiprono breaking the tape hands raised in 2:12:37. Volpato also started her attack between 32-35km, through the Cascine Park. Only Braham tried to hold on while Mancini slowed and Melaku suffers a crisis. At 35km Volpato was followed by Braham at 33 seconds, by Mancini at 55s and by Melaku at 1:13. The finish was a triumphal parade for Giovanna Volpato, crowning her return to the marathon with a convincing victory after an absence of more than a year. The 13th edition attracted a record 20,000 runners from 51 countries, writes Chris Turner. Zafaris Spyros, the Mayor of Marathon (the Greek town which gave the event its name) brought a flame, ignited in Marathon, to Shanghai. This flame was used to start a torch relay run along the marathon route before the race began. The race started from Century Square at 07:30 on Nanjing Road East and ended at Minhang Stadium. New course records were set in both men's and women's races. Gashaw Asfaw, 30, who finished seventh in the Beijing Olympic Games, knocked 3.5 minutes off the previous best, in a completely dominant performance. Irina Timofeyeva, 38, who won the 2008 Hamburg Marathon winner in a personal best of 2:24:14, was also a seventh place Beijing Olympic finisher. 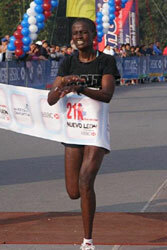 She improved the previous women's best in Shanghai (2:29:28) by over three minutes.